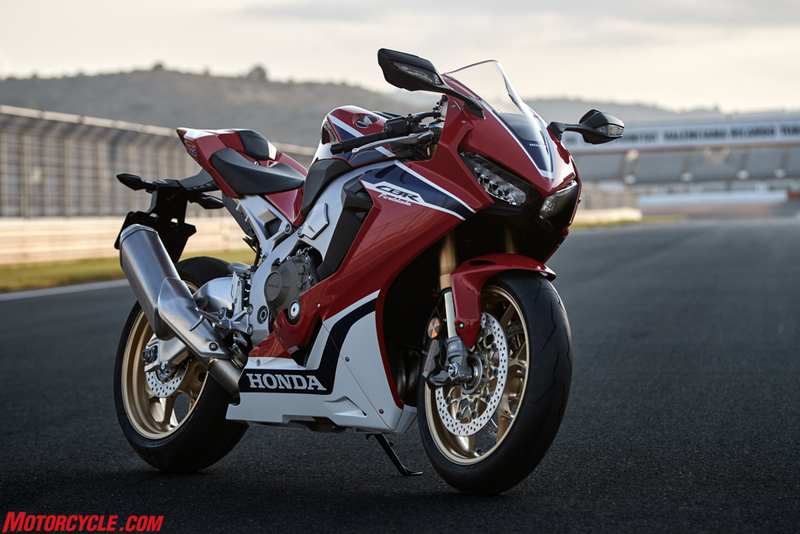 Just as we suspected, Honda today unveiled its much anticipated 2017 CBR1000RR at Intermot in Germany. 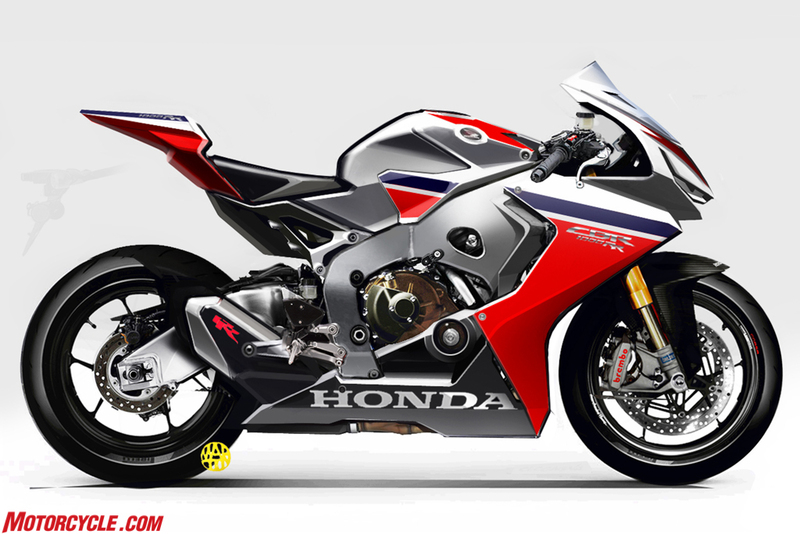 We first reported on the new CBR last month as spy photos started to come out, but Honda still had a few surprises in store with this announcement. Two, actually. 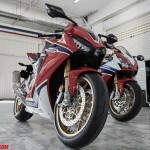 First, Honda decided to release its up-spec model, the CBR1000RR SP, ahead of the standard edition (Honda says to expect an announcement on that one come November). 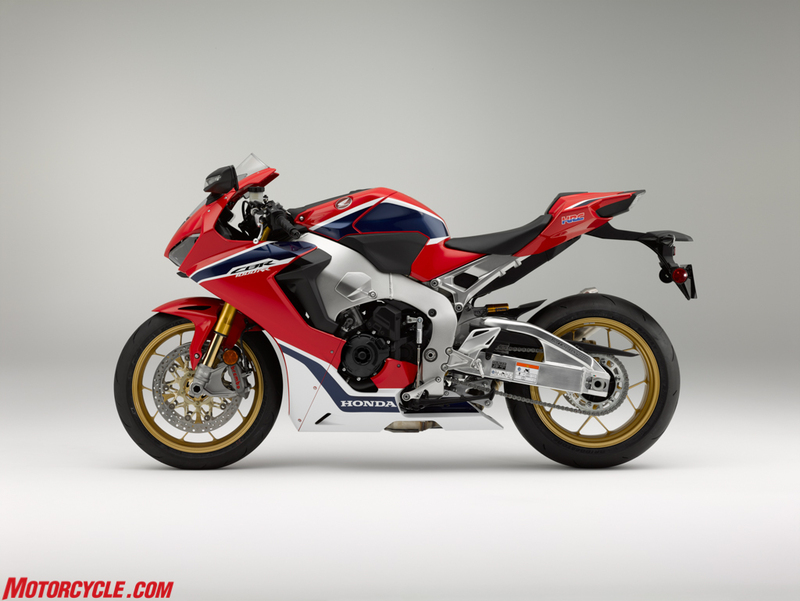 And second, there would be a second, limited-edition model, the CBR1000RR SP2, homologated strictly for racing purposes (more on that later). 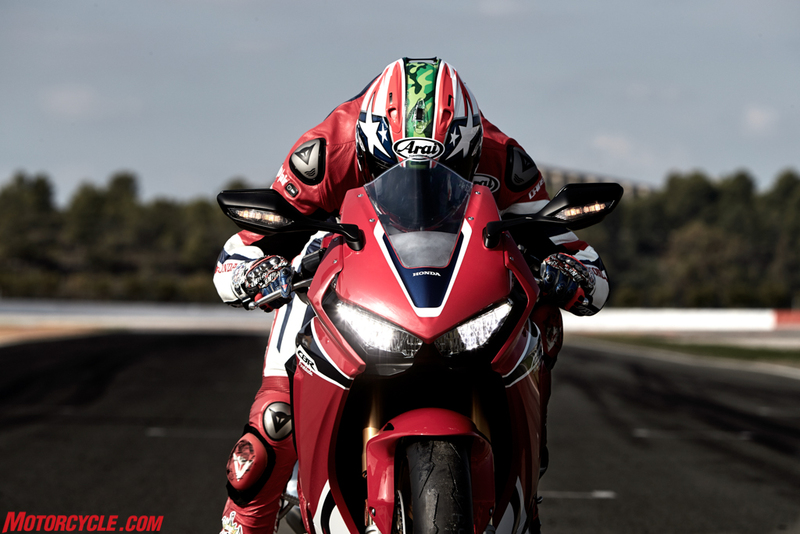 Nicky’s smiling because Honda’s finally coming out with a new CBR1000RR SP. 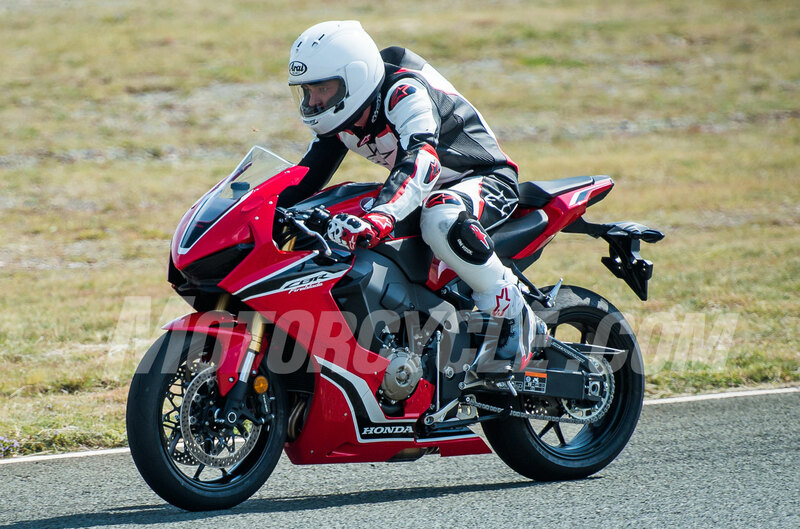 Incorporating the latest electronic rider aids and safety equipment is a relatively recent phenomena, necessitated by the outrageous power today’s liter-class sportbikes are putting out. 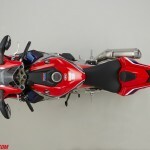 But the first two objectives have always been the emphasis for sportbike designers, yet as time marches on and global regulations change, sometimes vehicles have to put on some pounds in order to comply. 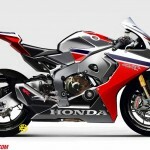 The tightest set of regulations to date take effect on January 1, 2017, when Euro 4 standards kick in, but still, Honda has met the challenge with the new ‘Blade, claiming it to be a whole 33 lbs lighter than the current (Euro spec) SP model while pumping out 10 more horses with 68% new parts. 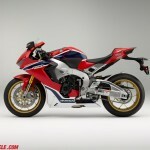 If this weight claim holds true, then expect the new CBR to weigh around 430 lbs, fully fueled, which would undercut all of its Japanese and German rivals. 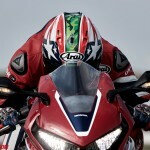 For comparison, the Euro-spec Yamaha R1 is claimed at 438.7 lbs, Kawasaki’s ZX-10R is 454.2 lbs, Suzuki’s 2016 GSX-R1000 is 451.9 lbs, and BMW’s is S1000RR 449.7 lbs. 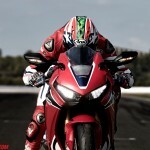 Only the Ducati 1299 Panigale weighs less, at 420 lbs. 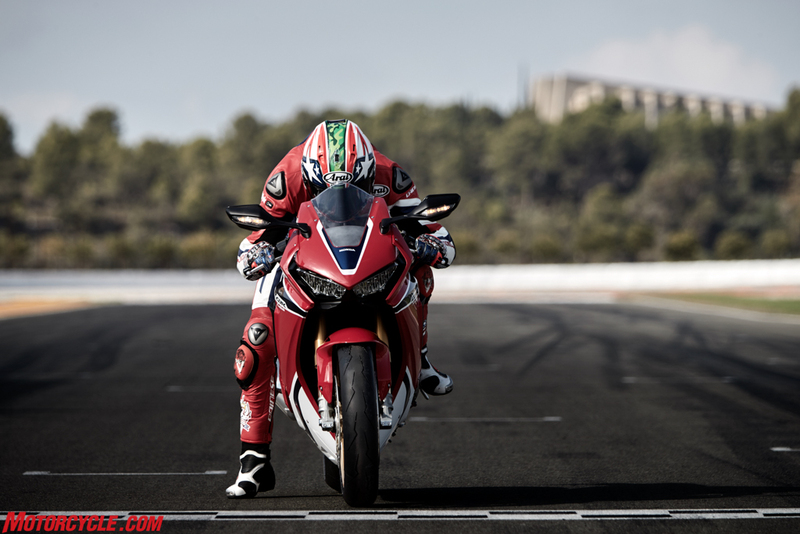 In all, the new bike has a 14% better power-to-weight ratio compared to the outgoing model. So, let’s dive into the specifics. 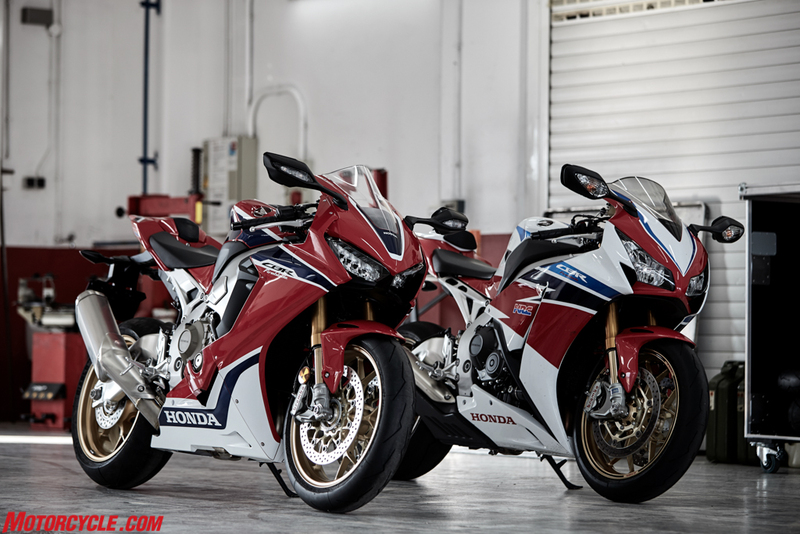 New and old CBR1000RR SPs together. 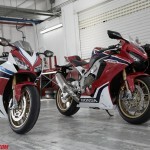 While not revolutionary, the new SP is a big step forward in the evolution of the CBR. We start with the chassis because, as I noted in the spy photo story linked above, the frame looked very similar, if not identical to, the current model. That was done intentionally by Honda, as the current CBR1000RR was praised for its chassis, both by racers and publications worldwide, including MO. 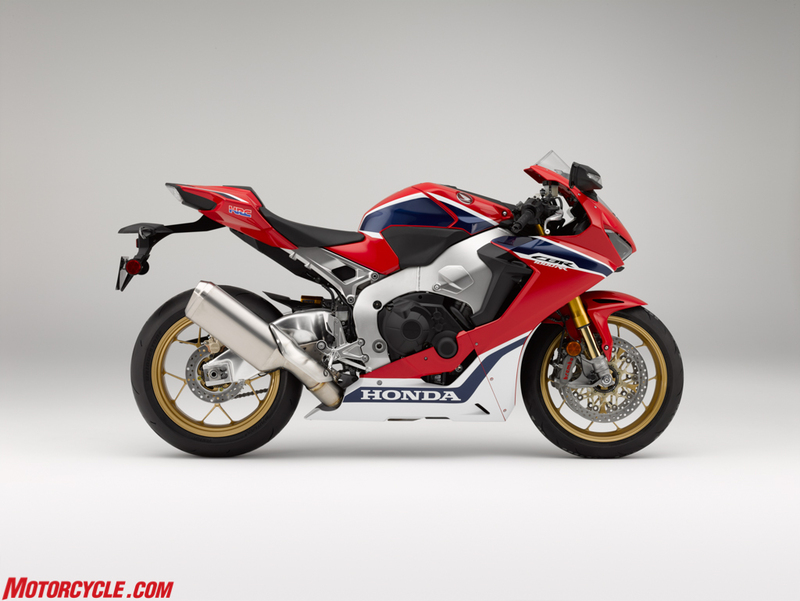 In keeping with the Total Control design ethos, Honda decided against reinventing the wheel, essentially taking the old ‘Blade’s chassis and reincorporating it for this new model. However, that’s not the whole story. 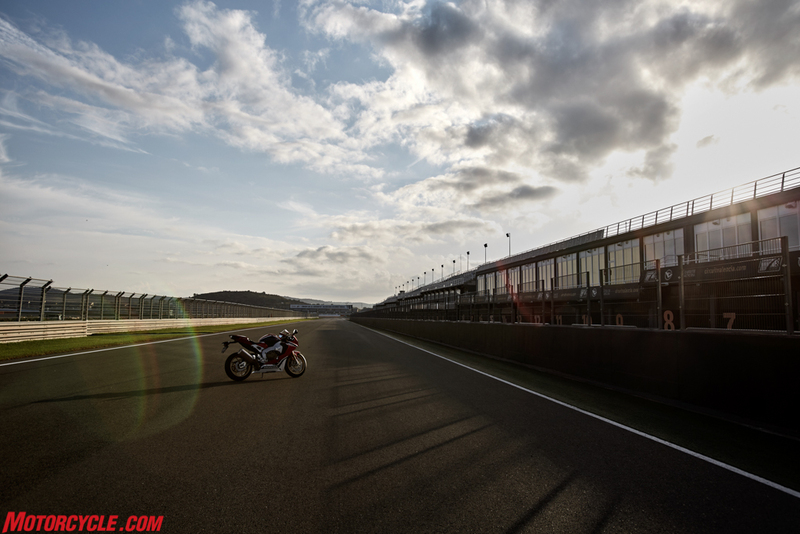 Portions of the frame walls were thinned down, resulting in 300 grams of shed weight and different chassis flex characteristics to give the rider better feel – and control – especially at the limit. The die-cast aluminum subframe was overhauled as well, losing 600 grams. Meanwhile, swingarm section thickness was also adjusted, resulting in increased torsional rigidity while losing another 300 grams. Wheels, too, haven’t been overlooked; the six-spoke design of yore giving way to a five-spoke design on the new bike (each spoke then splits into two at each tip, so you could argue it’s a 10-spoke design). Weight drops 100 grams, aided in part to the aluminum spacers also used on the new bike. 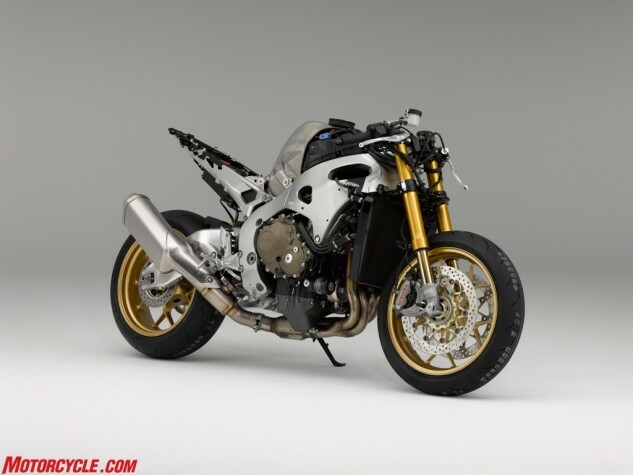 Without its skin, we get a better look at the frame, subframe, engine and front suspension. 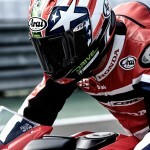 Honda says all were optimized in order to give the rider Total Control. Styling is generally a subjective issue, and while I think the new bike looks great (especially in person), objectively the new skin is both slimmer and lighter than before. Honda’s focus in the styling department was for a more aggressive, yet minimalist design. 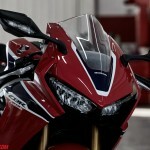 Hence, more of the engine components are visible when viewing the bike from a side profile. 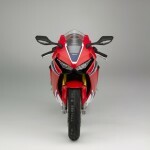 The front of the upper fairing is now 24mm narrower than before, while the front of the middle fairing is 18mm slimmer. 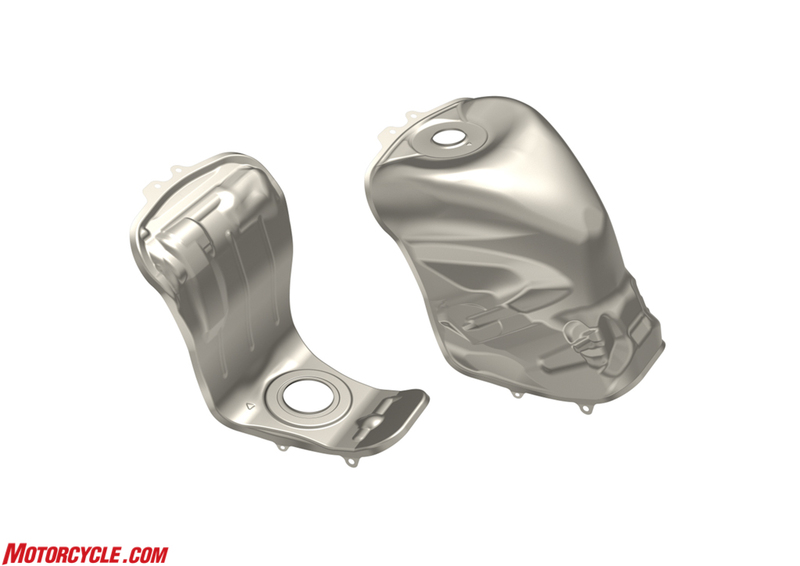 The big news in the quest for weight savings is the use of a titanium fuel tank – the first time this has been done in a mass-produced motorcycle. 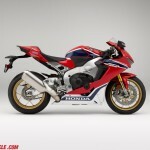 Honda says the new tank is now 2.87 lbs lighter than before and is 30mm narrower at the seat/tank junction. 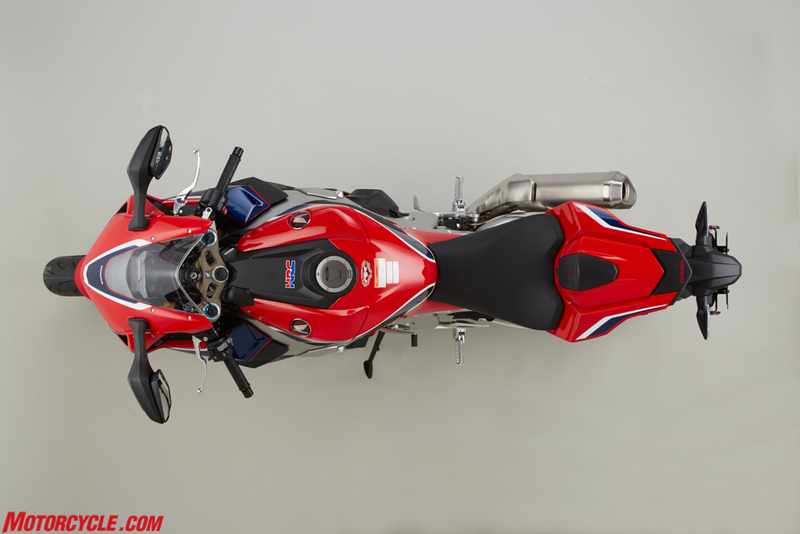 The rear view gives a better look at the titanium fuel tank (a first for a mass produced motorcycle) and exhaust canister, as well as the new subframe. 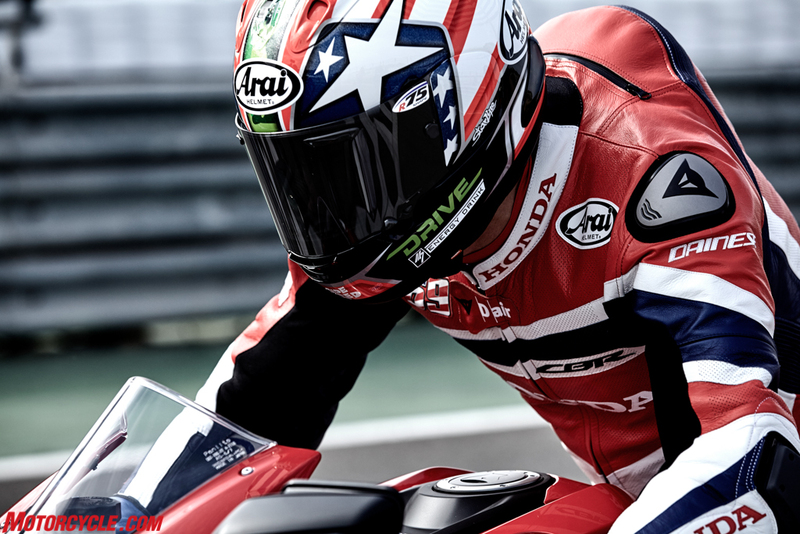 Honda emphasized the importance of the rider being in control, and how these improvements will help achieve that goal (ironic, considering Honda’s MotoGP efforts have placed engineers over rider input, but that’s beside the point). 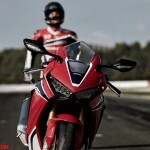 According to Honda, with the new chassis, yaw and roll moments of inertia have been reduced 15% and 10%, respectively. 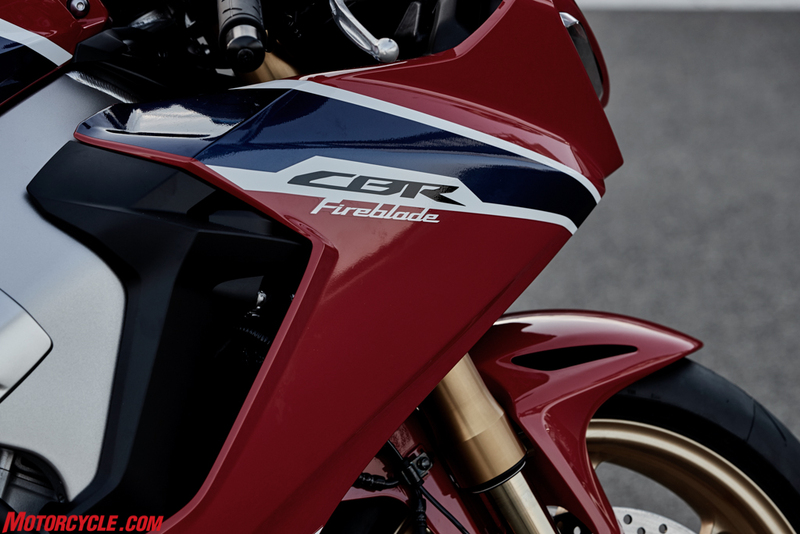 The outgoing CBR was criticized for its lack of sensors and electrons, but that ends with the 2017 model. 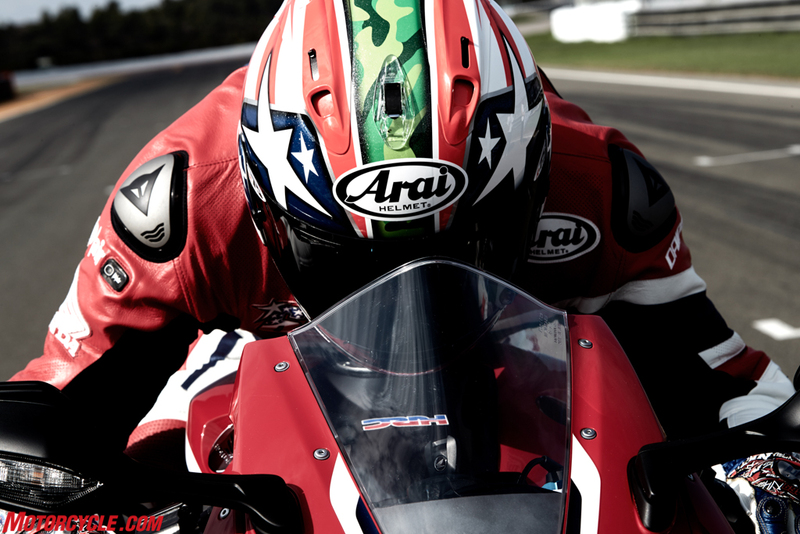 Inspired by technology seen on the RC213V-S, the new CBR1000RR SP is now littered with sensors, anchored by the five-axis IMU. 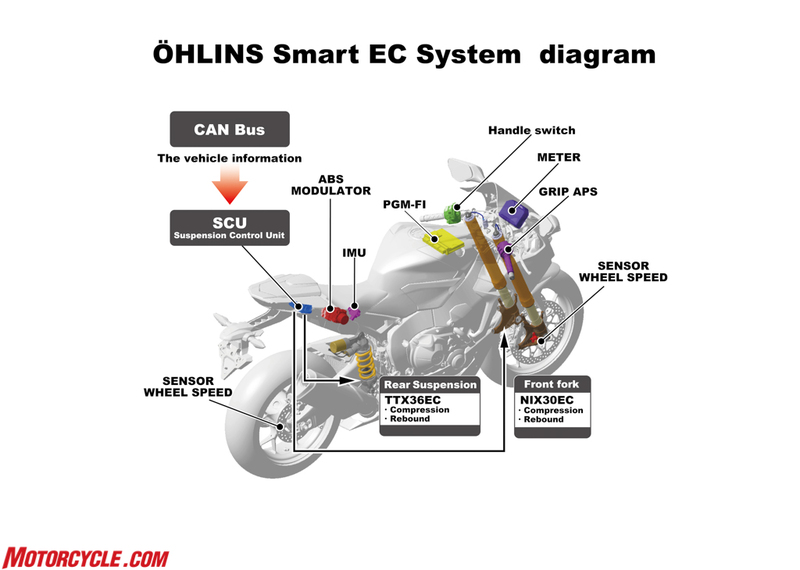 First up on the list of electronic components is the semi-active Ohlins Electronic Control suspension – the first time semi-active suspension has been incorporated into a Honda production motorcycle. A 43mm NIX 30 EC fork is mated to a TTX 36 EC shock, and their signals are sent to the suspension control unit located just under the passenger seat section. 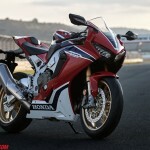 Where the previous CBR1000RR was scarce in the electronics department, the new CBR is littered with sensors. 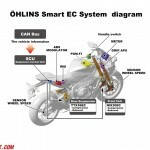 This schematic is just for the new Ohlins Electronic Control suspension. 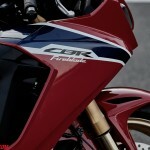 Finally, the new CBR utilizes ride-by-wire, a first for a Honda inline-Four. This is necessary to incorporate the numerous aids facilitated by the IMU. 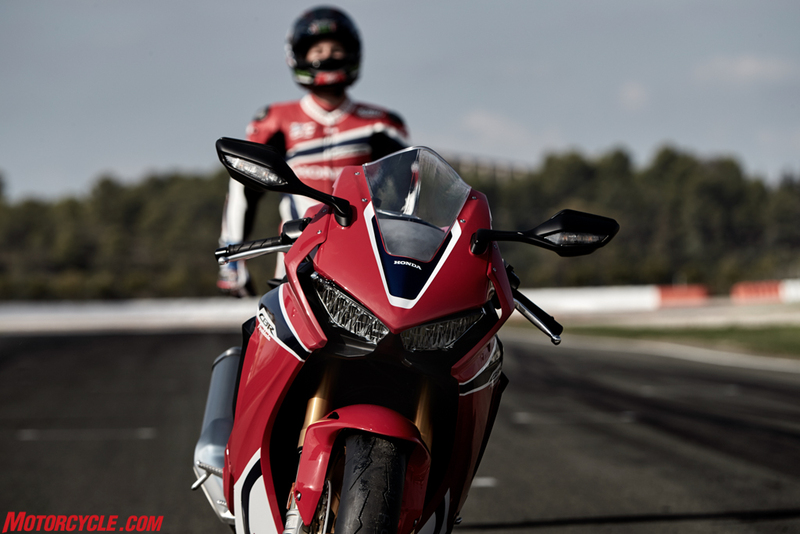 Honda Selectable Torque Control (HSTC) is Honda speak for traction-control, and the nine-level system (plus off) is derived from the RC213V-S. Like most contemporary systems seen in competitor models, the Honda’s traction-control system utilizes inputs from the wheel-speed sensors and IMU to determine slip rate and lean angle, using technology, boasts Honda, first developed for the ASIMO robot. 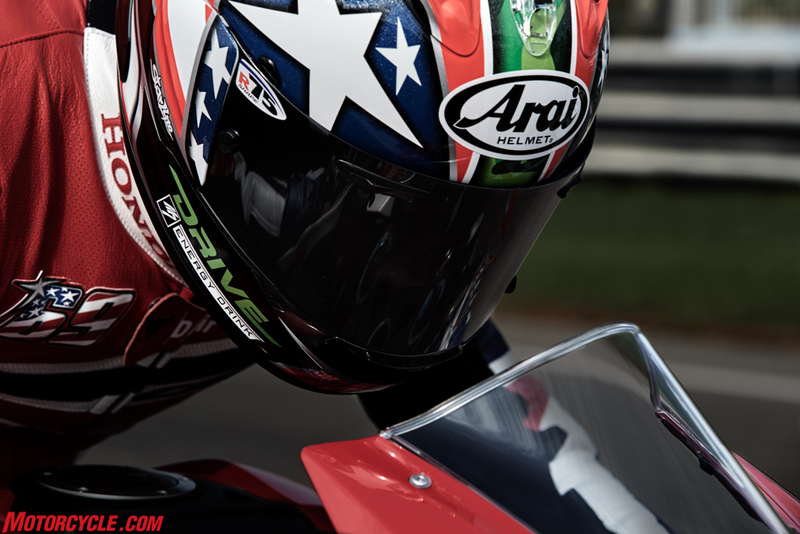 Depending on the level the HSTC is set to, when slip is detected, the software can react and have the bike totally eliminate any wheelspin, or it can electronically maintain throttle to allow a bit of spin before cutting in (regardless if the rider’s right hand is asking for more throttle). As always, the system isn’t a guarantee against highsiding, but it has been developed with lap times in mind, as a little bit of spin is sometimes necessary to finish a corner. 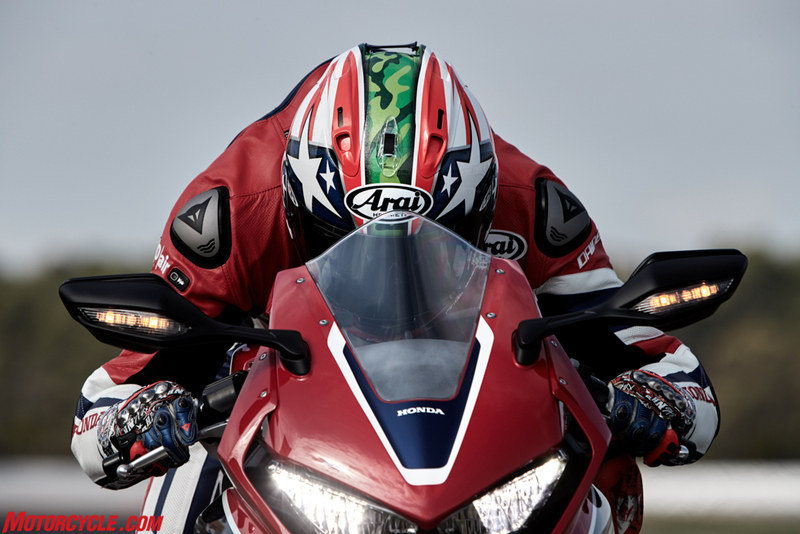 Placing the rider in control means more now than it has before. Instead of turning clickers and adjusting suspension settings, the new SP model allows its rider to fine tune settings at the push of a button. 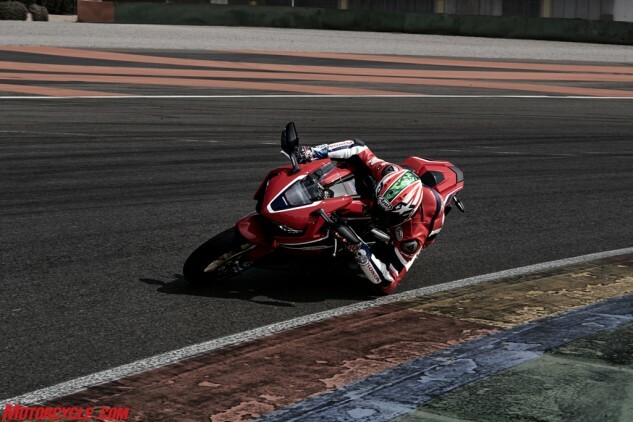 With the addition of HSTC comes wheelie control and engine-brake control. 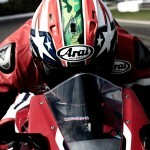 The former also uses the IMU to predict and mitigate wheelies per the rider’s settings. 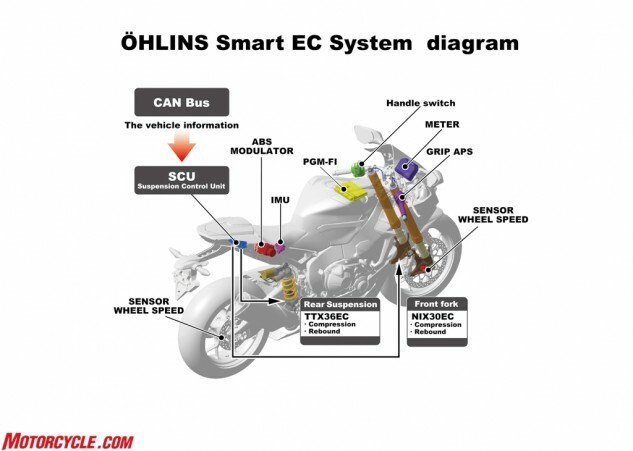 Like the HSTC, when a wheelie is detected via the wheel-speed sensors, the ECU can command the throttle valve to limit power and bring the front tire back down. The latter is adjustable to three different settings to suit rider preference. More adjustability comes in the form of five-way adjustable riding modes, the first three modes suited to “fast riding”, “fun riding,” and “comfortable riding,” with power, traction control, engine brake control, and electronic suspension settings set accordingly. 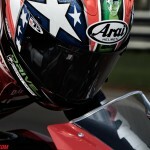 The last two modes are able to be customized by the rider. 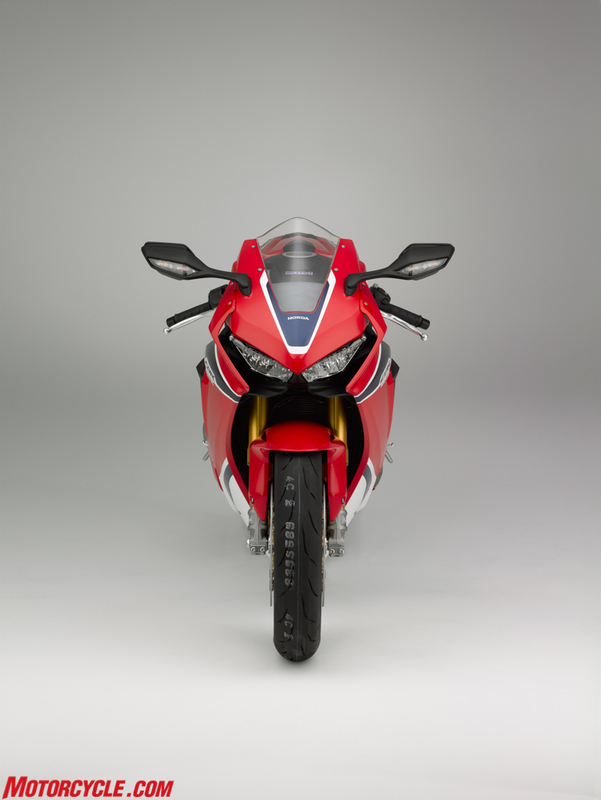 To add a little confusion to the mix, the power modes are also adjustable to five different settings within these five riding modes; level 1 providing max power, with power output going down incrementally to level 5. 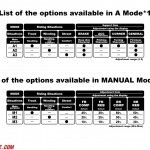 Ride modes, HSTC, and suspension settings are all adjustable on-the-fly. 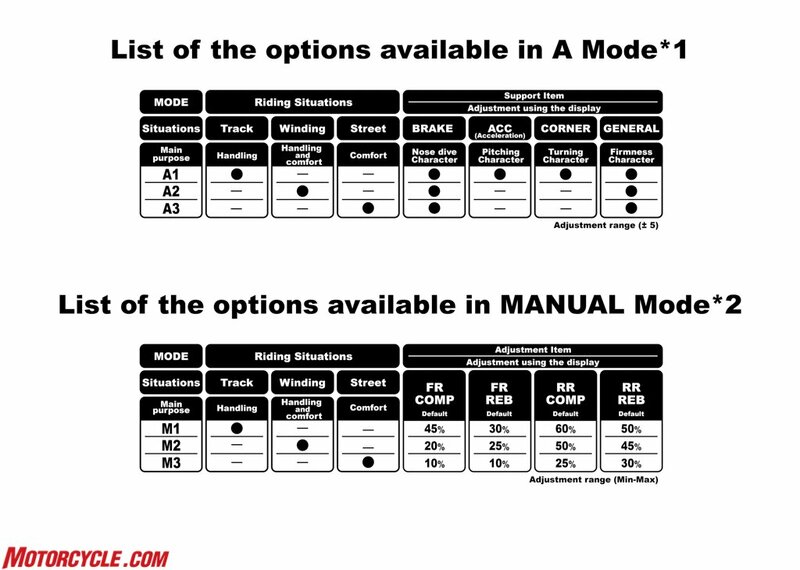 This chart illustrates the parameters set for the five different riding modes. Note the last two modes are completely customizable – you can have one dedicated track setting and another for your favorite canyon road. 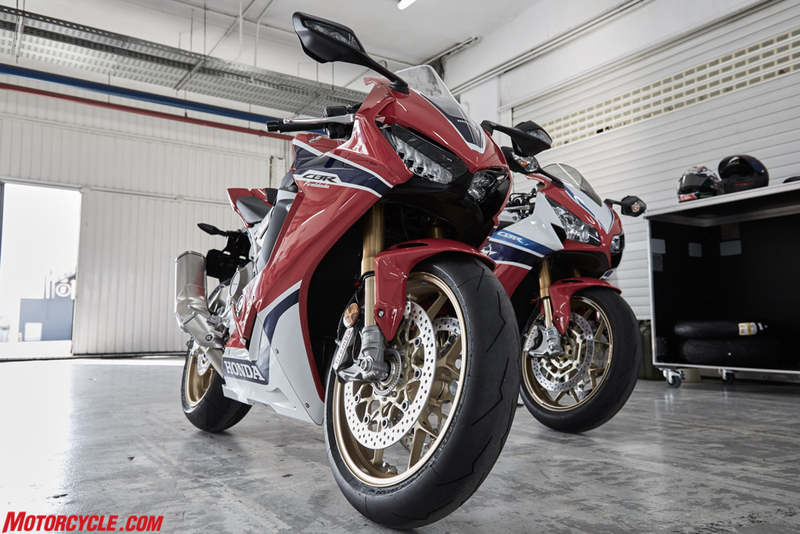 ABS is another feature of the CBR1000 SP, and this time, it’s linked to the IMU, giving the CBR rear-lift mitigation and, more importantly, lean-angle-sensitive braking, a.k.a. 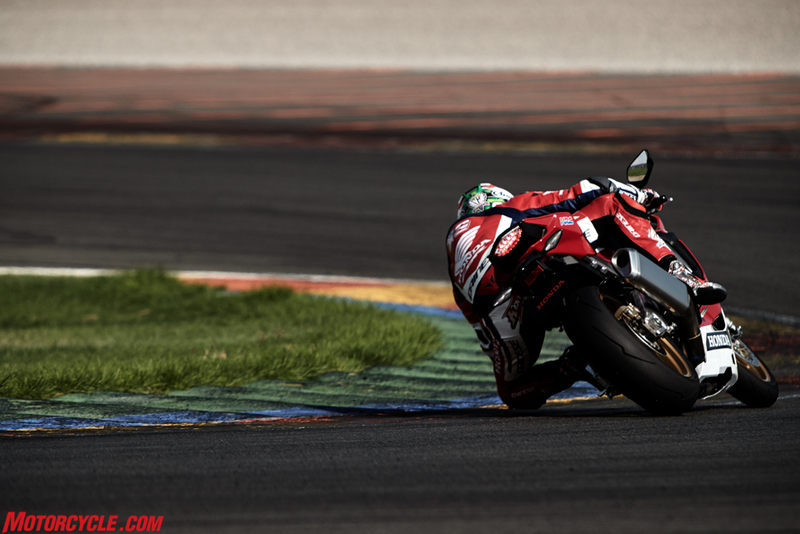 Cornering ABS. 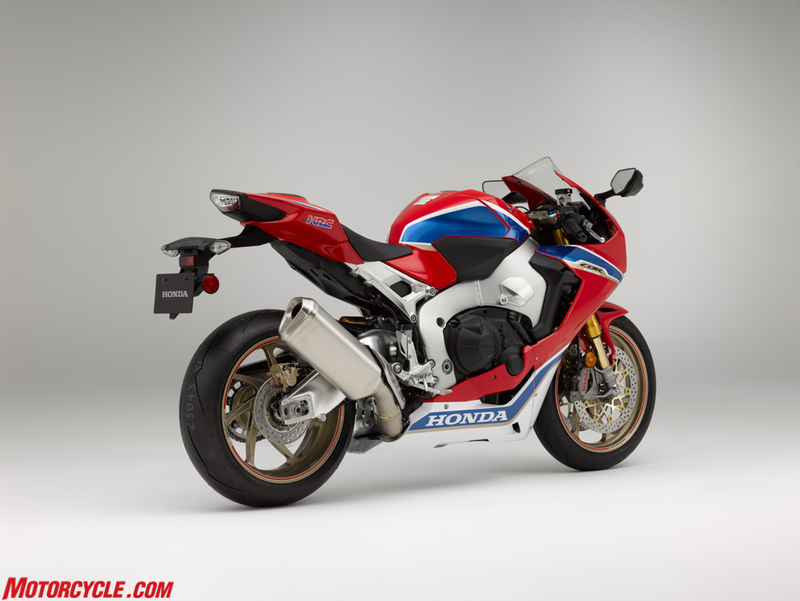 Unlike other Honda models, ABS is not linked on the CBR, and the rear ABS can be deactivated if the rider desires. 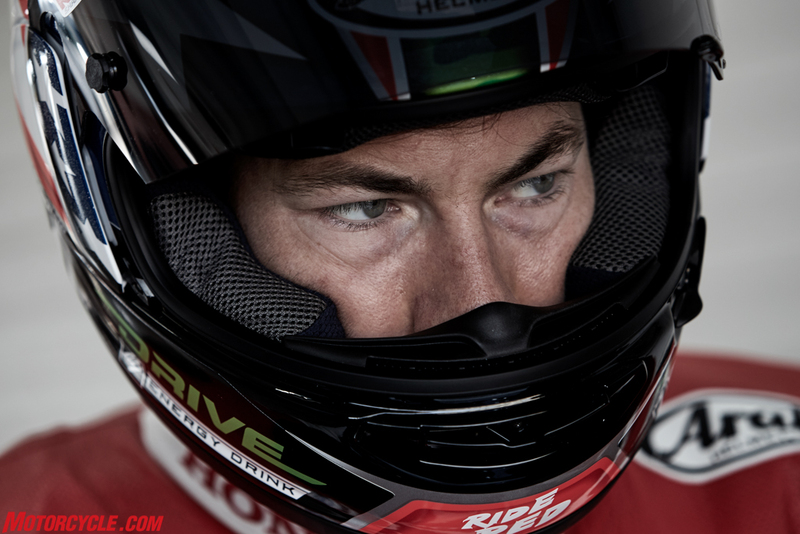 Now that the new CBR1000R SP has gained a little extra power and is lighter than nearly all of its rivals, Nicky Hayden might have a contender on his hands for 2017. Providing all the information to the rider is a full-color TFT display (another first for Honda) that’s 50 grams lighter than the display unit on the 2016 model. It’s switchable between three displays: Street, Circuit, and Mechanic, the latter providing a whole host of information on the performance of both man and machine. This includes things like maximum lean angle achieved and a scroll of lap times per session, among its many other features. 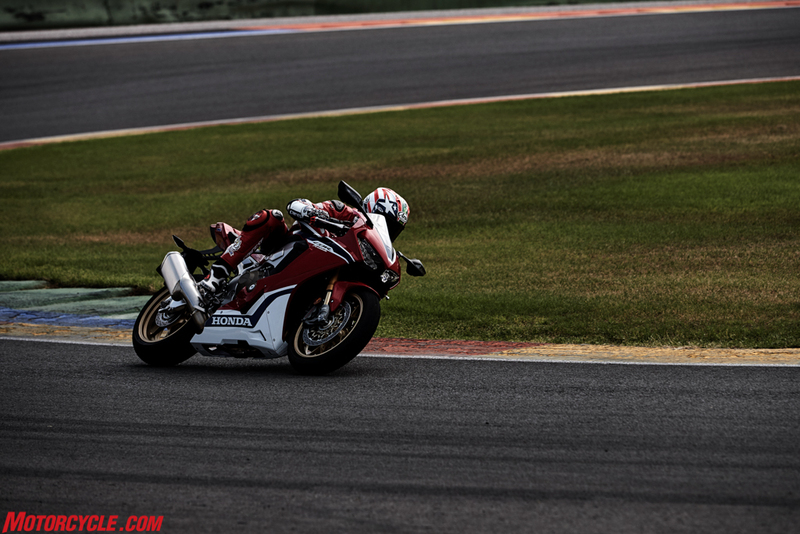 It’s a sign of the times that the engine bay is the last stop in our tour of the new CBR1000RR SP. 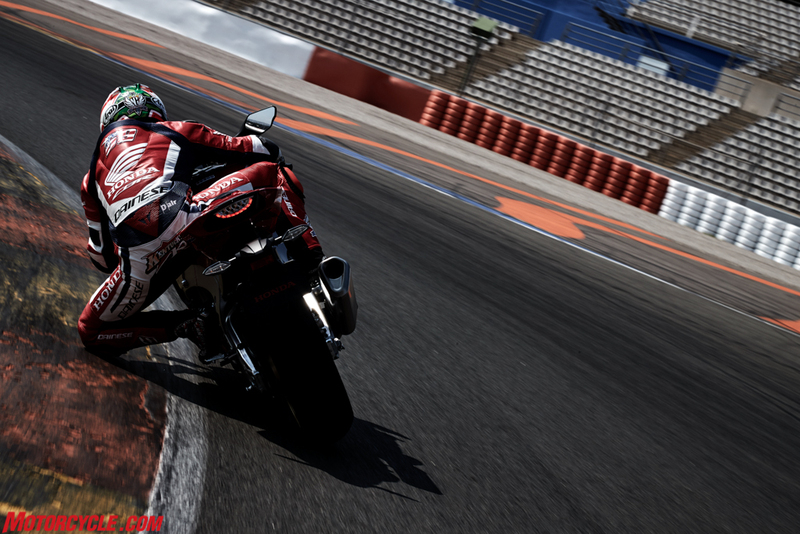 Liter-class sportbikes make more power than us mere mortals know what to do with anyway. Effectively putting that power to the ground is much more important, but nonetheless, if there’s a way to squeeze out more power, Honda engineers were going to find it. Bore and stroke remain the same as before (76mm x 55mm), and the majority of the internals remain the same, too. The 10-hp increase was achieved with relatively simple methods. First, compression ratio is bumped to 13.0:1 from 12.3:1, while piston rings receive a Diamond Like Carbon coating. Camshafts haven’t changed, but both intake and exhaust timing have been optimized for the CBR’s increased rev ceiling – up to 13,000 rpm from 12,250 rpm. 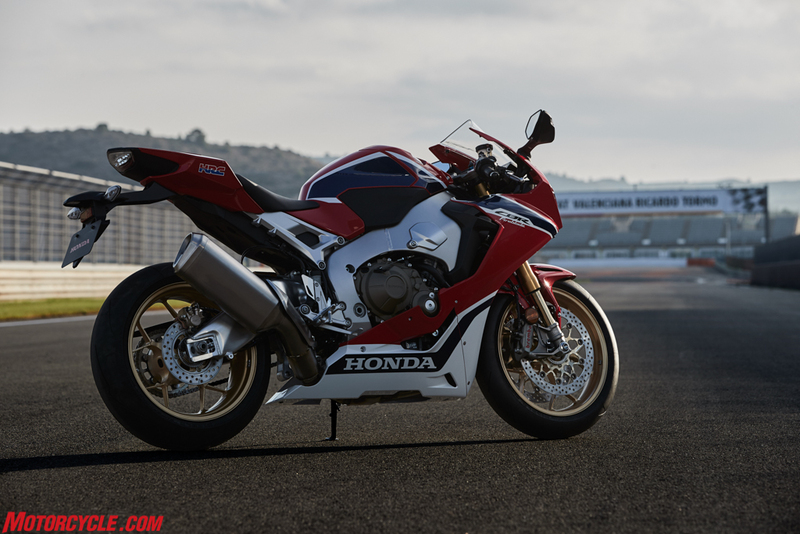 The updated CBR engine isn’t drastically different from its predecessor, save for lighter components, a higher rev ceiling, and increased compression ratio, but Honda says it makes 10 more horses and weighs 4.4 lbs less than before. 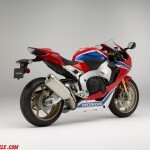 The CBR gets a new airbox and air-intake duct, and the throttle body is now 48mm, up 2mm from before. Fuel discharge pressure is up 14% to promote better fuel atomization and optimize combustion efficiency. 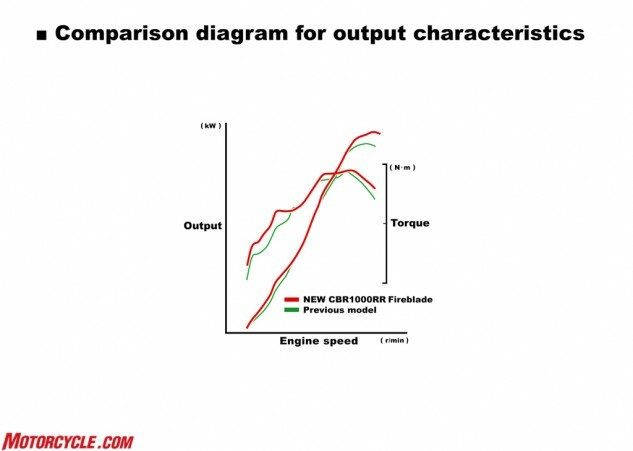 That’s really it when it comes to power adders on the latest CBR. 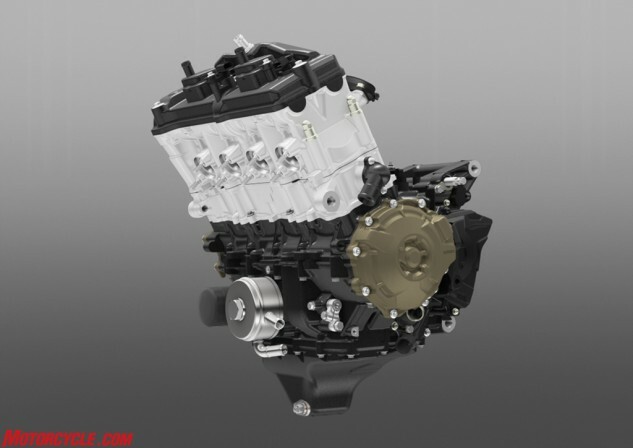 The rest of the updates center around weight reduction, as Honda claims the new engine is 4.4 lbs lighter than its predecessor. 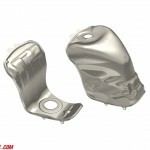 Clutch cover is aluminum, while ignition cover – and oil pan! – is now magnesium. Both the pressure plate and clutch cams within the slip-assist clutch are now die-cast aluminum, also for weight savings. While not an internal engine component, the new ‘Blade’s radiator is 30mm narrower than before, reducing its projected frontal area and its weight by 100 grams compared to before. Despite the reduced area, an updated high-density core allows the radiator to achieve the same level of heat dissipation as the outgoing model. Lighter hoses and clamps also contribute to the weight reduction. 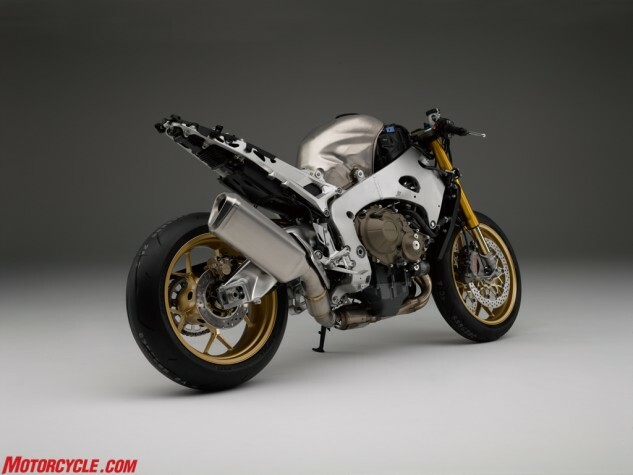 Continuing with the weight-loss theme, the exhaust canister is now titanium, resulting in 6.17 pounds shed compared to the previous bike and an improved concentration of mass. 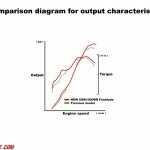 According to Honda’s power graph between old and new CBRs, the 2017 model bests its predecessor substantially in the low-mid rpm range, then pulls an advantage on top because of its higher redline. 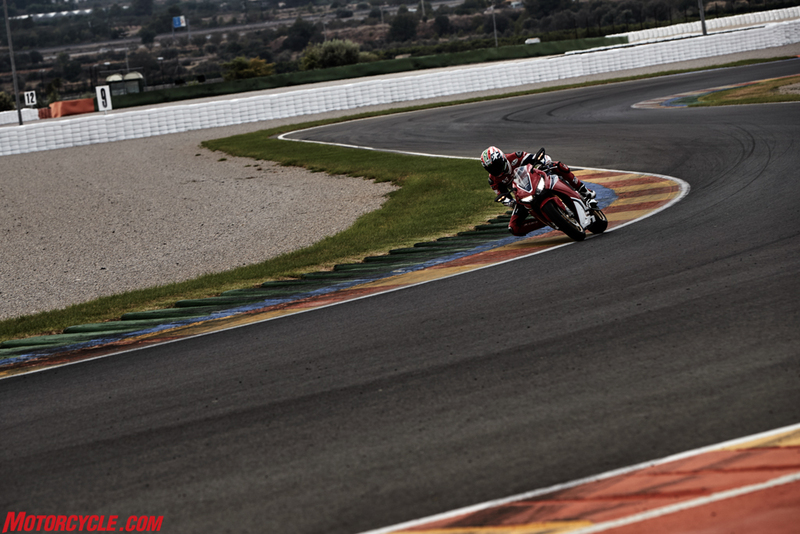 Interesting that the two bikes are relatively even in the midrange. Pricing has not been set yet, but Honda America estimates the 2017 CBR1000RR SP will be under $20,000. 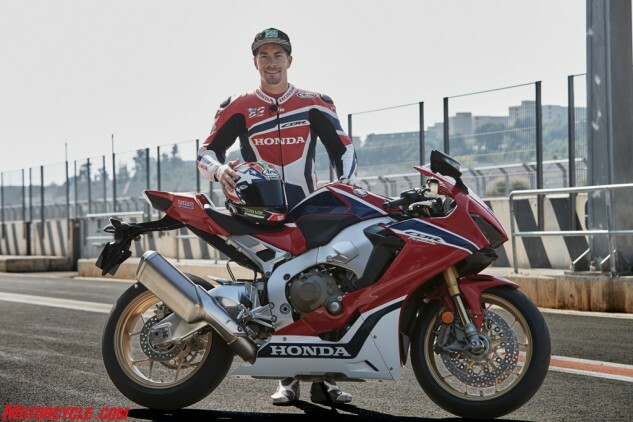 If you’re wondering whether Honda is serious about going racing again (contrary to belief, the Ten Kate World Superbike team Nicky Hayden rides for is not a factory effort), the SP2 should put those worries to rest. A homologated version of the SP – U.S. reps predict a limited production run of 500 units globally to be built over the next two years – the CBR1000RR SP2 receives 1mm larger intake valves, 1.5mm larger exhaust valves, and a change in included valve angle to 10º on the intake side and 12º on the exhaust, versus 11º on both sides for the standard SP model. 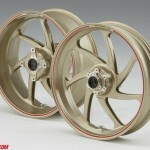 Forged aluminum Marchesini wheels are also part of the deal. 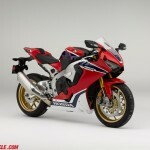 Honda’s homologated racing special, the CBR1000RR SP2 will be sold in extremely limited quantities. If you want one, you better be one of the best – in the world. 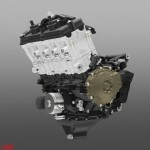 Honda reps were tight-lipped about what’s to come but stated the revisions to the cylinder head to receive the bigger valves and the updated included valve angles were part of a bigger plan to incorporate a suite of HRC parts. 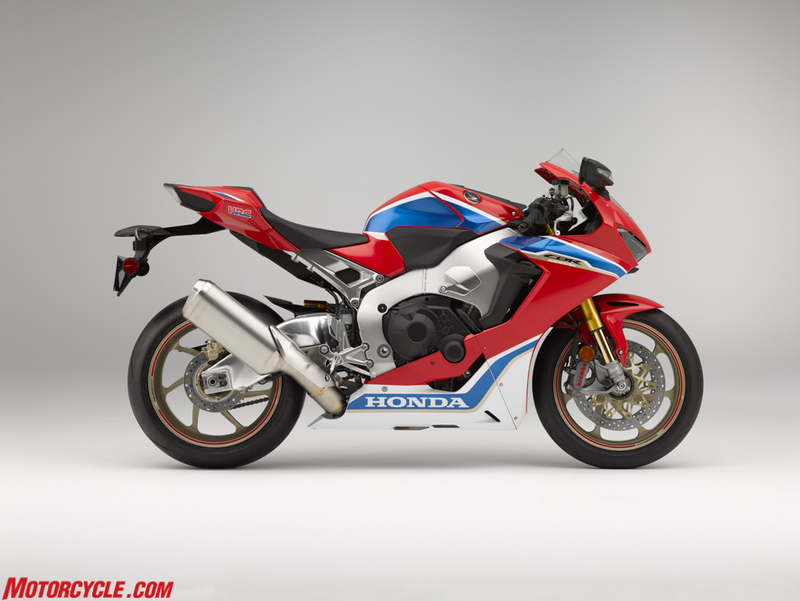 Now the bad news: the SP2 will be difficult to get to begin with, and Honda reps stated the HRC parts won’t be something the average racer can simply purchase from their dealer. 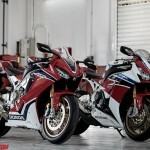 The parts will be reserved for professional racing teams, with Honda/HRC determining who will get access to them. 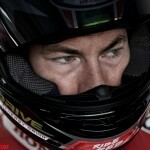 Simply put, if your name isn’t Nicky Hayden, you’re probably out of luck. 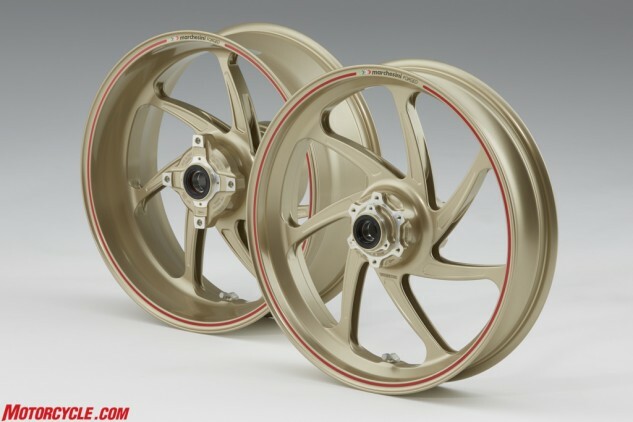 Forged aluminum Marchesini wheels. Yummy. As for the good news: the CBR1000RR SP2 is estimated to cost less than $25,000. 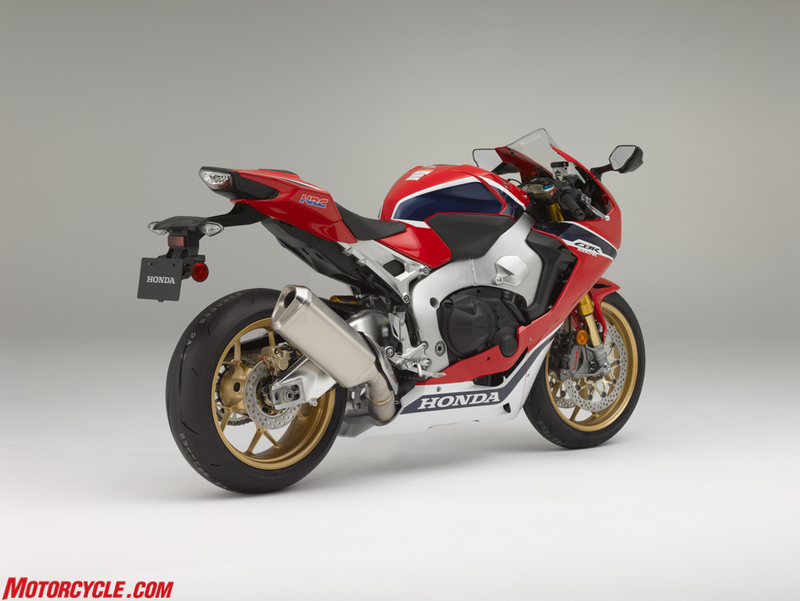 For those wanting a standard version of the CBR1000RR, Honda will make an announcement come November regarding its availability. Those with keen eyes will have noticed from the spy shots linked to at the beginning of the article that the model seen in those photos is void of the Ohlins suspenders and Brembo brakes of the SP model. 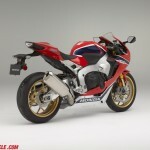 If history is any indicator, Showa will provide suspension on the base model, with Nissin brakes. 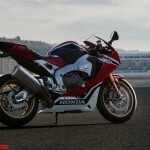 American Honda reps didn’t provide any information on the standard model, including pricing information, but expect it to be priced competitively with its rivals. 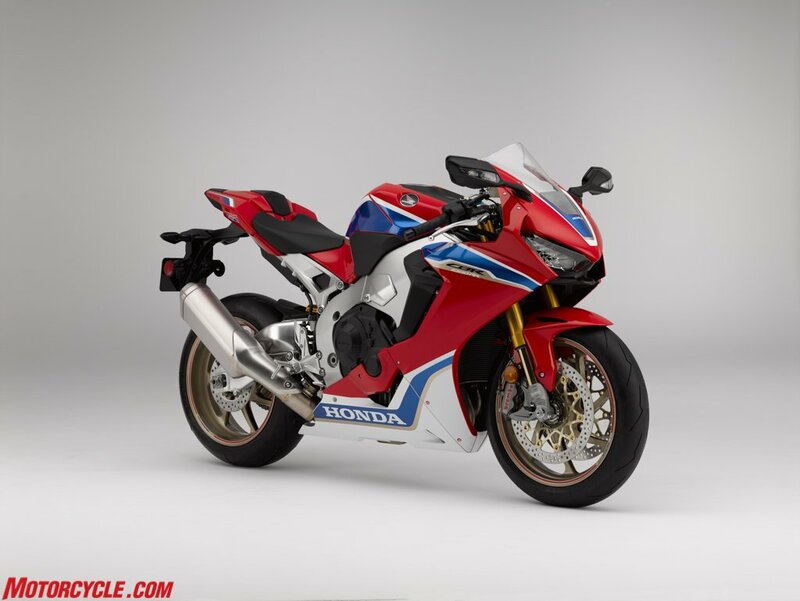 Now that we know more about the CBR1000RR SP, we’re inclined to believe the early spy shots of the CBR1000RR we published earlier would be the standard model, not an SP edition. 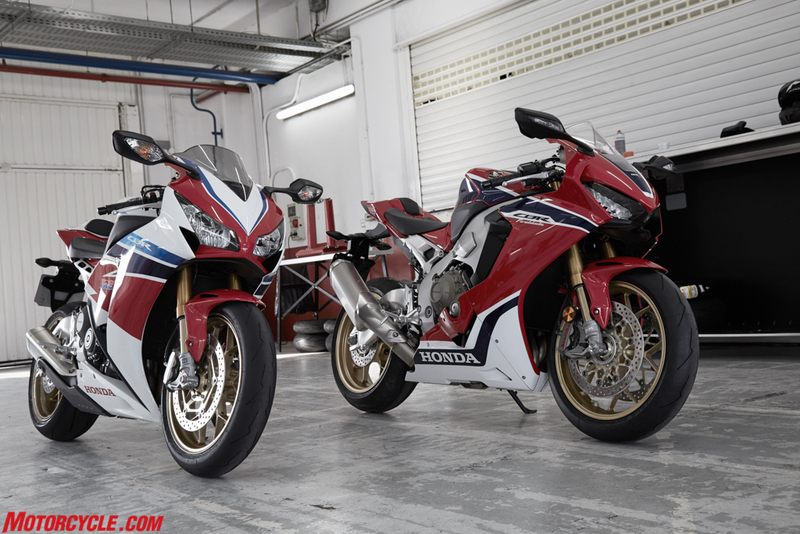 Honda says we’ll get to ride the new CBR1000RR SP around March 2017. Stay tuned for our riding impressions then.